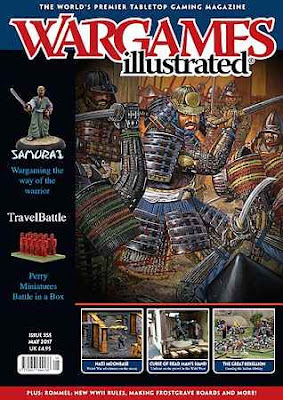 For WI355, our theme is Samurai, and we present five articles in the form of painting guides, scenarios, history, army organization, rules, and figure information. As well as a Test of Honor card based on our latest Giants in Miniature, Oda Nobunaga. Our latest look at new and forthcoming products, including our ‘Spotted at…’ show feature, which this time looks at items from the Tactica show in Hamburg. Jonas Svensson of Mura Miniatures introduces us to this month’s theme, telling us what we need to know about gaming with Samurai. The Perry twins reveal their new boxed game and tell us why it’s taken 25 years to make! Some were heroes, others were villains, but it cannot be denied that these masterless Samurai are one of the most iconic elements in Japanese history. Rebellion, Mutiny or Battle for Independence, the events in India in 1857 had a profound effect on relations between the British Empire and the Raj for years to come. They also make for great wargaming. David Bickley tells us how. The campaign for Burma during World War Two is full of stories that defy belief but make for great wargaming fodder. Neil Smith takes us on a journey to this often over-looked theatre of operations. Just how do you organise and base a Samurai army properly? Pete Brown offers some ideas and guidance. When we were preparing for our second Frostgrave Day, WI graphic designer Ian Bennett ‘volunteered’ to create some boards for the gamers to adventure across. Read all about Oda Nobunaga, a ruthless warrior who championed the arquebus and went from a ridiculed son to placing his choice for Shogun on the throne. Sam Mustafa provides an insight into this upcoming World War Two wargame. One man’s quest to take the world of 7TV into near space, complete with that perennial favourite of certain types of media: Moon Nazis! Something wicked is stirring in the Wild West. We play through the latest sourcebook for gun slinging skirmish game Dead Man’s Hand. War using the former’s incredibly adaptable rules. Your handy guide to the origins of almost every miniature featured in the magazine.